The Picturesque Plainsman is a Believer in Women's Voting, But Not Their Bloomers. A Breezy Interview on Women's Clubs and Self Reliance. Western Men and Their Gallantry Championed—Women Should Have Something to Occupy Their Time. 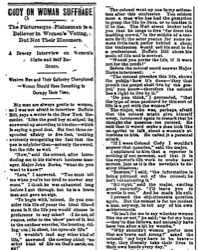 Big men are always gentle to women, so I was not afraid to interview Buffalo Bill, says a writer in the New York Recorder. Like the good boy at school, he answered up according to his size—which is saying a good deal. Six foot three  responded affably to five foot, nothing evidently recognizing the fact that the pen is mightier than—not only the sword but the rifle as well. "Now," said the colonel, after introducing me to his stalwart business manager, Major John Burke, "what do you want to know?" "Lots," I answered. "You must tell me when you're too tired to answer any more." I think he was exhausted long before I got through, but he is a brave man and gave no sign. "To begin with, colonel, do you consider this life of youer the ideal life—I mean is it the life you would choose in preference to any other? I do not, of course, refer to the 'show' part of it, but to the outdoor exercise, the hunting, riding, etc. ; in short, the open-air life." "I wouldn't lead any other kind of life," answered the cowboy chief; "no other kind of life on God's earth; no, sir!" The colonel went up one in my estimation after this confession. You seldom meet a man who has had the gumption to grasp the life he likes, or to confess it if he has. The Wall street broker tells you that he longs to live "far from the madding crowd," in the middle of a ten-acre field; the actor yearns for some remote little back parlor behind a shop; the tradesman would sell his soul to be a professional. Buffalo Bill chose his mode of life and is content. "Would you prefer the life, if it were not for the profit?" "The colonel preaches this life, shows the public how it's done—'they that preach the gospel shall live by the gospel,' you know—therefore the colonel has a right to live by it." "Do you think," I proceeded, "that the type of man produced by this sort of life is a pet with the women?" The major, who was, perhaps, afraid that the colonel might give himself away, interposed again to remark that he thought the question too pointed. He said that it would make a man look like an egotist to talk about a woman's attention to him. He called it a personal attack. "If I were Colonel Cody I wouldn't answer that question," said the major. I explained to him that a reporter is nothing if not personal, and that it is the reporter's life work to probe heart secrets, just as it is the novelist's to destroy illusions. "Besides," I said, "the information is being pumped out of the colonel; he isn't volunteering it." "All right," said the major, smiling good naturedly. "I'll leave you to wrestle it out." And he made his exit. I pressed the objectionable question again. But the colonel is far too modest a man, anyway, to tell any of his own achievements. "It isn't for me to say whether women like me or not," he said; "as for my boys—they're fine fellows, and naturally have been run after a bit by women." "Why shouldn't women prefer men that are brave and strong?" asked the colonel; "my boys have to be brave—why, they literally take their lives in their own hands every day." "Do you find that sport and exercise supply the place of women's society? Some horse lovers aver that it does." "Emphatically no. A hardy outdoor life makes a man value women's society intensely. The men out west, where there are few women, have the greatest respect and admiration for women. No men think as highly of women as the western fellows." "Well, sir, have you any ideas on woman's suffrage? This is the question of the hour, you know, otherwise I wouldn't thrust it on you." Colonel Cody confessed that he had not thought much about it. 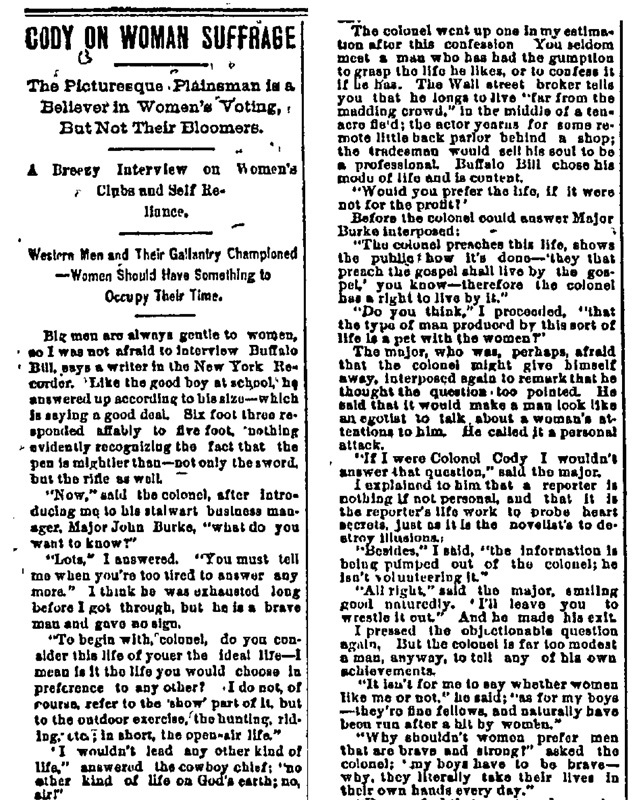 "But, now that you speak of it," he said, 'I am in favor of women voting. Why not? Women are developing wonderfully just now, and can do many things which they couldn't do twenty years ago. I think it's a good thing for women to have something to occupy their minds. Times have changed, and, whereas, a woman would have been hooted a few years back if she had dared to work in an office along with men, now we recognize that so long as she does her work well and is womanly, she is far better there than wasting her time at home playing with the cat. My wife doesn't care about voting, but if she wanted to I'd let her trot right up to the polls every time." "Do you think the majority of women capable of voting? "Yes, quite as much as the majority of men." "Hurrah! colonel, you're on our side!" "Then you don't condemn women's clubs?" "Far from it. I'd a good deal rather feel that my daughter was at a club along with intellectual ladies than out with some men. In fact, I think it is a capital idea." "Do you approve of physical culture for girls?" "Certainly, it makes them graceful." "I think they're all right; they brace a woman up and give her form." "Now, about costume. What do you think of a reform costume for women?" Here I indicated with a gesture those zouave affairs, which some women think would improve our condition. "A woman ought to be shot who wears them—if you mean those bloomer things. I think skirts are modest and pretty. I prefer something left to the imagination." "I would like to know something about your boys. Are they the holy terrors painted by the dime novelists?" The colonel smiled. "They're the besthearted, pluckiest, most faithful fellows anywhere. Will stick by me and each other till the last. They're a bit wild sometimes, after they've been in the saddle for a few days at a stretch and not a drop to drink, nowhere to get it, miles from anywhere. Then they have a wild spell and and raise the devil. The reaction is perfectly natural. Men who drink every day never experience this." "What will you do for buffalo in the future. They say that the race is dying out. Will you breed them yourself?" "There are not enough left to breed them from, but that won't make any difference. The show won't shut up because of the buffalo. At this point in the interview an interruption occurred in the form of autograph hunters—ladies, of course. It occurred several times during the interview. "Are you engaged, Colonel Cody—we saw that you were talking to someone in the back tent?" said a lady. "Oh, I've excused myself for a minute," answered the colonel. "I'm only being interviewed." He spoke of the process as gently as he might of manicure or chiropody. "Well, then, will you write us your autograph—we should value it so much?" The hero of the saddle compiled. And then I heard "Thank you so, so, so very, very, very much!!!!" And they went home delighted. Then the interview went on where it had left off. "Is it true that the Indians are also dying out?" "Not yet. There are plenty of them left. America was peopled with Indians about 100 years ago. There were in reality about 600,000. There are now about 800,000. There are plenty of them so far." "This ring was given me by Prince Luitpold, regent and heir presumptive to the crown of Bavaria, who will probably become king now. He came to see my show several mornings in succession, and was skeptical about my bucking horses. He thought that we put tacks under the saddle or otherwise irritated them in some way to make them buck. He told me that he wouldn't believe it was genuine. "He made an appointment for the next morning at 8." "However, it turned out that he had to review his men that morning at 8, so he came at 7, and, of course, I was not there. However, the horses were brought out just the same, Prince Luitpold observing everything narrowly. He asked who was going to mount it. Thought there might be something in that. He was told that any of the boys would mount, it didn't matter which. "One of the boys was mounting when the prince objected to the spurs. 'Take those off,' he said. "A prince has to be obeyed. They were taken off. "All this time he was standing dangerously near the bucking horse. Langdon, my big one armed cook, was standing near, and, knowing the danger, begged him to come further off. "But he wanted to see everything, and, before there was time to prevent it, the horse had given a violent plunge, and horse, rider, cook and prince were in a heap on the ground. I met a man riding up to me in great excitement. "When I got there he was insensible. But he is a game old fellow, though 70 years of age, and he was soon up again. He was quite convinced about the genuineness of the bucking horses, and gave handsome presents both to Langdon and the man who mounted the horse. It was then that he gave me this ring." The ring is a marquise of diamonds sapphires, decorated with the royal arms and the prince's monogram. "Now," said Buffalo Bill, as he tucked half a dozen complimentary tickets in my bag, "anything more?" "No, thank you, that's all." And if he isn't a pet with the women he ought to be. Don't you think so?